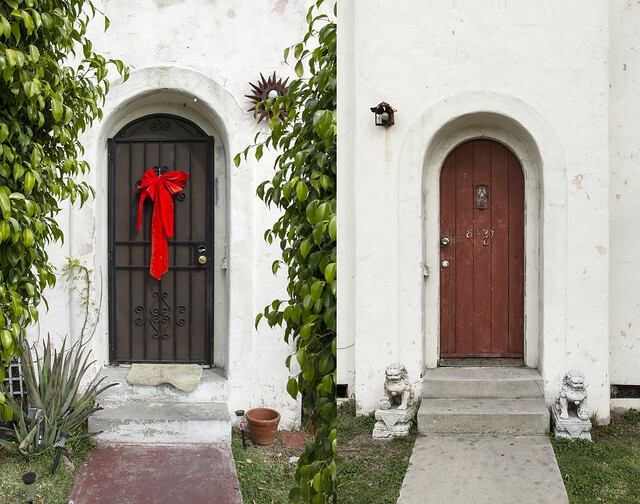 These two houses sit side by side in the heart of old downtown Downey. Nowadays, the area is filled with businesses small (a cleaner's, a chiropractor) and large (banks, the post office). But 100 years ago (or around 1920), these were family homes, just down the street from district attorney James C. Rives. From the back yard, the residents could probably see the balcony of Rives' mansion. I couldn't find any information on the history of these homes. But I can imagine, with their matching architecture, that they were built by the same person, maybe for an extended family? What do you imagine?